RING - SARAH COVENTRY. "INTERCHANGE" FROM 1979. 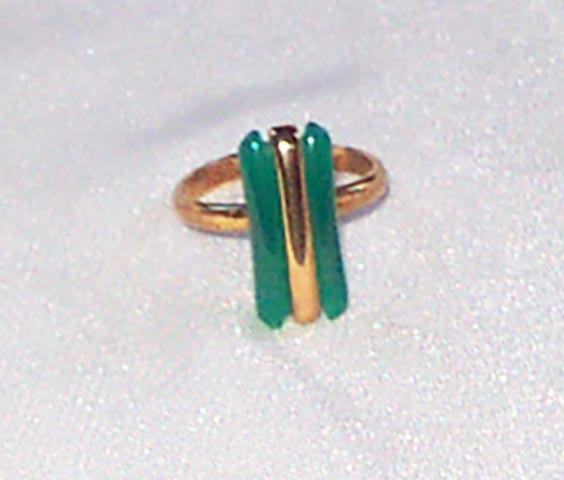 NARROW GOLDTONE BAND AND GOLDTONE CENTER STRIP WITH GREEN PLASTIC GEOMETRIC INSERT. THIS ONE ORIGINALLY CAME WITH A INTERCHANGEABLE BLACK AND WHITE INSERT TOO - BUT THIS LISTING INCLUDES THE BLACK INSERT ONLY. ADJUSTABLE. RING TOP IS 3/4" LONG. GOOD CONDITION.